That question may be startling! It did get your attention though. What are some of the things that threaten our veterans lives? Why? Wasn’t a war zone enough to put our Hero’s through??? This is the short list! 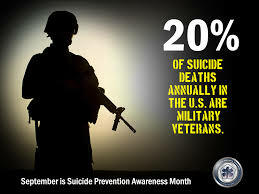 Let’s talk about Veteran Suicides which is a growing problem and is not getting better yet! 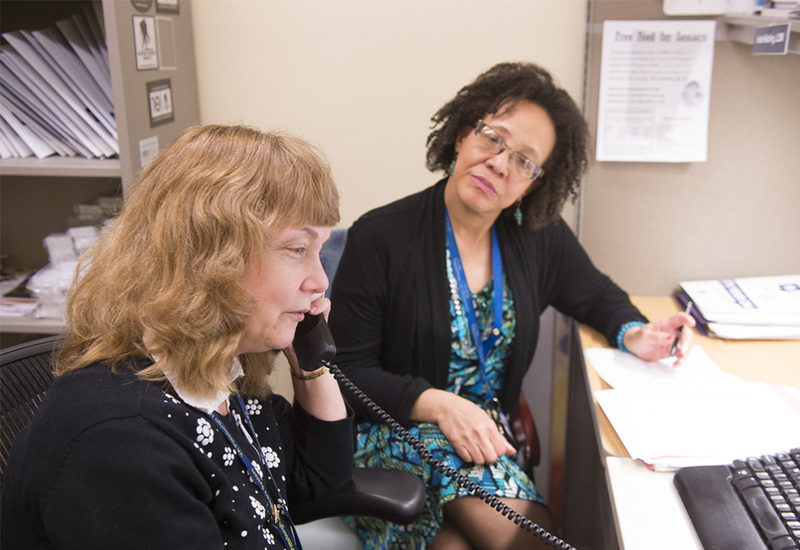 Calm, Cool and Collected — Krista Mechling (on phone) and Veronica Lucious make a good team at Pittsburgh VA’s Suicide Prevention Office. The phone rings. You answer it. The Veteran on the other end of the line tells you he’s alone in his garage, and he’s about to put a handgun in his mouth and pull the trigger. Back to my blog: Suicidal thoughts are greatly exacerbated when coupled with substance abuse and/or surprisingly, a poor diet and junk food. When our bodies are out of whack and in a poor balanced state we become extremely acidic. Our brains hate an acidic imbalance. This can cause terrible Panic Attacks, Anxiety and much more. Add that to PTSD, TBI and depression and you have a timebomb. Is there some real help in getting our bodies back into a PH balanced state in short order? Yes there is and it is much easier than you think. More info on that in this article. I won’t spend a lot of time explaining why this is dangerous. It takes little imagination to understand just how bad that is. Having just one of our heros homeless is sickening. We have many thousands in every state!!! Are there times when prescription drugs are necessary. Absolutely!!! Extreme physical trauma, due to an accident, is one. There are quite a few other reasons that exist. However in most instances we rely on drugs in place of putting in some effort to allow our bodies to do what they do best and that is its own healing mechanism. Our bodies are the finest doctors in the world. We don’t give them a chance by loading them down with garbage. Muscle pain, dizziness, nausea, anxiety, insomnia, coughing, hair loss, fluid retention, liver problems — these are just a few of the side effects associated with some of the most popular prescription drugs of 2010. These prescriptions include medication for high cholesterol, high blood pressure, low thyroid function, and diabetes. What’s troubling to me is that side effects can happen when taking just one of the drugs. What happens when you’re on multiple drugs? Some combinations we already know are dangerous. For example, taking warfarin (a blood thinner) and simvastatin (a cholesterol drug) can increase the risks of bleeding problems. Yet there are many combinations that haven’t been studied and when you’re on three or four medications; there’s 100 percent drug interaction, and you have your own personal experiment in early death. Now we need to ask: How can we help save a veterans life? Aside from getting a potential suicidal soldier on a hotline what can we do to help a family member, friend or associate that is at their lowest ebb? It is important for us to have an understanding of what our vets are going through. You don’t need a ton of info just a little will help. I will be happy to point you to the quickest and easiest way to get it. this blog will keep adding articles. Check back often and email me questions. In my case I had to do years of research to save myself and my marriage. Back when I had my most serious issues there just wasn’t much info available. There was no Google. Hell there wasn’t an Internet at all!!! Today there is plenty of info available like this blog. You want to get your info from older vets, like me, that have been through the mill and learned how to survive. It is generally your best source. People say; “But you are not a doctor”! Actually I have many more years of study than most doctors. I have had to live it! Getting our bodies and minds back in balance could take a lot of exercise and life changing choices such as quitting smoking and drinking and keeping track of every morsel that goes into our mouths. That is why most people would rather rely on drugs to do the heavy lifting which allows them to continue their bad habits.Unfortunately this “Catch 22” lifestyle causes us to die way before our time. I am talking about dying thirty years earlier or more!!! Well that last paragraph is depressing. So what can we realistically do? Relax there is an easy answer! The hard part about getting back into a balanced PH is harder than ever if we have to rely on the GMO loaded products on our grocer’s shelf. Today we are extremely fortunate that many doctors have switched to natural products that actual heal us vs. drugs that are primarily just pain relievers. Many more people are deciding to become Naturopathic Doctors instead of MD’s. With all the research being done to find natural healers many all natural products have been found that do a far better job than drugs. Remember drugs reduce pain but do not heal anything!!! Pain is an important part of life. We wouldn’t pull our hand from a fire without it. Without some pain or discomfort we continue to make the same mistakes over and over. Through my years of research to help myself with PTSD, TBI and our work to heal my wife’s colitis we have found super food formulations that have worked beyond anything we tried from the regular medical community. As I have written in other blog posts the doctors and specialists told Ginger that she would never be rid of colitis. Thank God they we wrong!!! Through my research I became friends with Dr Chris Morris, a world renowned Naturopathic Doctor. He developed a formulation of natural products that come from the land and the sea. This formulation totally replaced all the nutrition that was missing in our diet. In my case it started balancing out my body’s PH from day one. The change in my thinking and things like memory was very apparent. My cortisol level balanced the first day. Cortisol is very important but too much is way too much. MY cortisol levels up till then affected my road rage, anger, desire to drink and much more. I no longer have panic attacks and so much more thanks to Dr Chris’s formulation. In Gingers case she started using the formulation during a flare up of her colitis which used to happen every few years. Within two weeks it was completely gone from her body. In over twenty years this had never happened before. Once it started it progressed for weeks and even months getting worse and worse. We are talking horrible pain and disgusting trips to the bathroom dozens of times per day. So do we love Dr Chris? You better believe it. Ask me how I get his formulation wholesale and I will send you more info. I will add some info on Dr Mike Lewis’ Omega 3 Protocol as soon as he sends it. Talk about an all natural TBI and Brain Issue formulation!!! West Point Trained Colonel (Ret) and Pentagon Doctor, Dr Mike is helping veterans all over the world. Here is some info I just received from Dr Mike. It is in response to my own Traumatic Brain Injury. Mine happened after Vietnam. I received a skull fracture and concussion when some young punks tried to rob me and were intent on murder. I actually lost my sense of smell due to this! I asked Dr Mike Lewis about his Omega 3 Protocol that I had learned about through research into Traumatic Brain Injury (TBI). I needed the info for my own issues with PTSD and TBI and any help it could give to the suicide situation with our vets. COL (Ret.) Michael Lewis, MD, MPH, MBA, FACPM, is an expert on brain health and the prevention, management, and rehabilitation of concussions and traumatic brain injury (TBI). He founded the nonprofit Brain Health Education and Research Institute in 2012 when he retired after a distinguished 31 1/2 year career in the U.S. Army. Dr. Lewis is a graduate of the U.S. Military Academy at West Point and Tulane University School of Medicine and completed his post-graduate training at Walter Reed Army Medical Center, Johns Hopkins University, and Walter Reed Army Institute of Research. Regarding veteran TBI, PTSD, and suicide, experience shows that the brain needs to be saturated with high doses of omega-3s in order for the brain to have the opportunity to heal. Without an optimal supply of omegas, healing is less likely to happen. Omega-3s are not a drug and not a cure. Omegas may have a positive impact on neuroprotection of brain cells, neuroinflammation, and neuroregeneration; each of those things plays a significant role in TBI, PTSD, and suicide. These three major problems faced by our veteran population overlap in symptoms and, unfortunately, outcome. Every situation is different and some people may respond better to high doses of omega-3s than others. However, there is no downside to providing optimal levels of nutrition in order to give a patient the best opportunity to regain as much function as possible, particularly when our military population has profoundly low levels of omega-3s. Research shows low levels of omega-3s correspond to a 62% increased risk of a veteran’s suicide. Something that can be improved with nutrition and for only pennies a day. To all veterans and their families: We can do this! There is all natural help that is actually way better than Toxic Drugs!! !